prednisone 10 mg We wish we had better news to share tonight, but we unfortunately did not get the news we had been hoping and praying for today. Emma’s scans showed that she had some growth or enhancement of some of the nodules on her tumor. 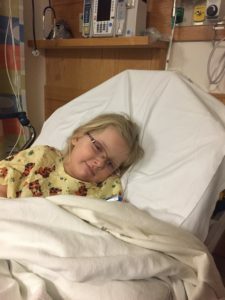 This means that her tumor is no longer stable and that we will need to start chemotherapy again to try and slow the growth that appears to be happening. This is not at all what we wanted to hear, but as we know good news is never a given and this disease can turn your life upside down at any time. enter site Dr. Chi explained that the growth that was noted was not huge, but was notable and with Emma having a large tumor there isn’t a lot of wiggle room. At this time the tumor is smaller than it was when we started TPCV about two years ago. We luckily saw the tumor shrink on that chemo regimen; however, the tumor is now bigger than it was 3 months ago. The growth is not enough that we are seeing any side effect for Emma at this time. She still has an empty cavity from where the tumor was removed two and half years ago that allows for some growth before it starts to cause pressure and motor issues. We are hoping starting a new chemo will keep it from growing this much so that Emma can continue to not have symptoms. source Dr. Chi recommended a couple of different options for chemotherapy, but after discussing things with her it sounds like starting the MEK Inhibitor, Trametinib, is the only viable option at this point. We had actually tried to get Emma on this treatment a few times in the past while it was in trial phases, but there were never any openings at the right time. The good news is that it is now available commercially so we are able to use it without having to get into a trial. This treatment is a targeted treatment and has had some good results with patients in trials. We are hopeful that this will be good for Emma. This treatment involves Emma taking a pill everyday for at least a year, possibly longer. The plan now is to start working on getting approval from insurance to start it, and also on discussing with pharmacy the best way to administer it. It only comes in a tablet form and Emma doesn’t yet swallow pills, so we either have to teach her ASAP or find out if can be crushed, dissolved or compounded. The biggest side effects are supposed to be skin breakouts/sores and nausea. It isn’t supposed to be as hard on her blood counts, which is good. http://cinziamazzamakeup.com/?x=farmacia-online-viagra-generico-200-mg-a-Firenze Enjoying the family time on the way yesterday. online propecia canada This has been a really hard day for us. Emma has had such a great year while being off treatment and we have loved every moment of it. We are so thankful for the gift of time we have had as a family away from all of the worry and side effects of treatment this year. I would be lying if I said we aren’t heart broken that it is coming to an end. We have always known that the end of chemo last year was not forever, we had just hoped it might be longer than a year. Good news is never a given, and unfortunately we were reminded of that again today. We are feeling pretty down and upset tonight. 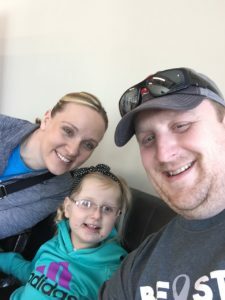 It is hard to wrap our heads around having to start treatment again and all that will bring. It is hard to realized that the life we were living last week will be very different for not just Emma, but our entire family in a few short weeks. The peace of mind we have had for the last 10 months since she finished treatment will no longer be there, and that is hard to accept tonight. viagra generico prezzo Even though we are feeling down right now, we know we can only feel this way for a short time. We have to get up tomorrow, and be ready to start fighting for our sweet girl. So that is exactly what we will do. She needs us to be her support and be positive and so tomorrow we start fighting again. God has blessed over the last four years with the support and prayers of so many people and that is what has gotten us through the hard times. Emma has such amazing prayer warriors, that we know once again we can lean on that support to find strength for all of us. Thank you to all of you for keeping us EmmaStrong!